Memory, like identity, can be a slippery thing. Not so, in the case of the elegant woman I am having lunch with at the Healing Hotel of the World member resort, Rancho La Puerta, near Tecate in Northern Mexico. Dr. Eger, a celebrated speaker and author, has been sharing stories with me of herself as a girl growing up in Kassa, Hungary (now Slovakia). She tells me that she was a talented dancer and gymnast with a bright athletic future. However, that was not to be. For the “crime of being Jewish,“ the Nazi’s made her forfeit her place on an Olympic training team. That hostility and aggressiveness toward her was just the beginning. How did she do this, I ask? Edi talks about one strategy she learned in the camp, when she was commanded by the infamous Dr. Mengele to dance for him. She made herself believe that she was performing on the world’s largest stage. She was existing in a“ stream of consciousness,“ she says, and that is how she often feels today when she works with her clients or as a speaker on stage. Edi is a tiny, almost fragile woman, still stunningly beautiful and always superbly dressed. She has a kind and generous heart, a sharp mind, and fresh wit. As we speak, she laughs as she share stories about her Sunday afternoon dancing dates in San Diego where she is regularly seen flirting with her 94 year old boyfriend. On weekdays she goes to her office where she maintains a practice as a clinical psychologist, helping her patients overcome loss, trauma and difficulties. When she was imprisoned in Auschwitz at the age of 16, she was forced to give up everything she had known in her world, including her own mother, who was taken from her side when they reached the camp. Hearing this chilling account must have produced an obvious shiver through my heart, which Edi feels, and she gently takes my hand. I first met Dr. Eger six years ago, shortly before her talk at Deepak Chopras “Sage and Scientist“ conference in La Costa, California. She was full of vigor and enthusiasm and shared with me, that she was about to speak about the „amazing transformational experience she had as a teenager in Auschwitz.“ Pain stabbed my heart as I heard this and I told her that I have a very hard time listening to any of the accounts of this horrific chapter in my own country‘s history. It did! The way she spoke about her life on stage to the global audience and the many teachings she gave with a heart full of love,kindness, compassion, wisdom and humor, brought the house down. And it broke down the walls of my own heart, which I had built up to protect me, when I learned about the Holocaust as a young person in Germany. And here we are today, with Edi describing the moment her mother was taken away from her. When they reached the camp in Auschwitz Edi gave the prison guard the “wrong” answer when he asked: “mother or sister?“ Young Edi answered, “mother“. And they took her away. Forever. To this day, Edi s voice still shakes when she talks about this moment. We are still sitting over lunch at Rancho La Puerta. Edi gathers her resolve and continues: “Auschwitz was an opportunity for an opportunity. There was nothing left for me to do but to go very deep inside of me to find a strength that had more power then the horrible outside reality. In the camp, we realized very quickly that this was not a time for a “me-me“ state of mind. In order to survive, we had to take care of each other because we only had each other then. When Edi says something like this – it matters. It matters as everything she talks about seems to matter today more then ever. “So why is it good to be 90?“ I ask. “Because you are free, honey,“ she says. „At this age, you have given up the need to please others. And you also let go of the craziness about wanting to be perfect“. As a teenager, she became acutely aware what it was that kept her alive in the horrendous circumstances in Auschwitz. It was an inner knowing that there was more to come in her life. Also she felt responsible for looking out for her sister and the other prisoners and honoring the connection they found in trying to survive and in taking care of one another. 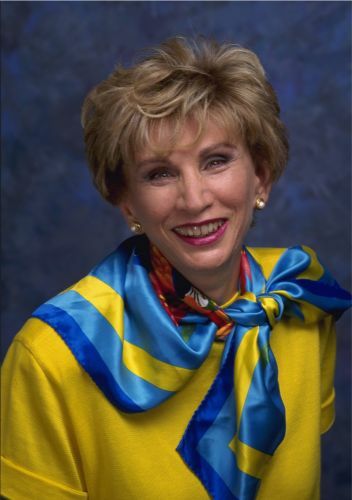 As we round out our precious time together, Dr. Edi Eger tells me that she has a dream. Her dream is that we not only empower each other but we also celebrate one another. Edi’s book “Choices“ is out now. Read it. It will free you!